"Elsinore" redirects here. For other uses, see Elsinore (disambiguation). "Helsingor" redirects here. For other uses, see Helsingor (disambiguation). 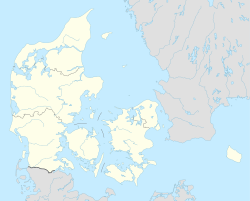 Helsingør (/ˌhɛlsɪŋˈɜːr/, Danish: [hɛlseŋˈøɐ̯ˀ]), classically known in English as Elsinore, is a city in eastern Denmark. Helsingør Municipality had a population of 62686 on 1 January 2018. It is known for its castle Kronborg, which William Shakespeare most presumably had in mind for his famous play Hamlet. The HH Ferry route connects Helsingør with Helsingborg in Sweden. Helsingør as it is known today was founded in the 1420s by the Danish king Eric of Pomerania. He established the Sound Dues in 1429, meaning all foreign ships passing through the strait had to pay a toll, which constituted up to two-thirds of Denmark's state income. With this income Eric of Pomerania built the castle Krogen. The castle was expanded in the 1580s and renamed Kronborg. All ships had to stop in Helsingør to get their cargo taxed and pay a toll to the Danish Crown, but it also generated a significant trade for the town. In 1672 Helsingør had grown into the third biggest town in Denmark.Johan Isaksson Pontanus (Rerum Danicarum Historica, 1631) attributes a long and partially fictitious history to Helsingør. The Sound Dues were abolished in 1857 with the Copenhagen Convention, where all naval nations agreed to pay a one-time fee. The oldest known fortified building of Helsingør is Flynderborg, an early medieval fortress situated on a hill just south of the medieval city. Around 1200, the first church, Saint Olaf's Church, was built. A number of convents once surrounded the church, but now all that remains is the church building, today the cathedral of the Diocese of Helsingør. The oldest parts of the cathedral of Helsingør date back to the 13th century and tell us that the fishermen's village, as Helsingør was then, had grown to a town of importance. The car ferry line between Helsingør and Helsingborg, Scania, Sweden is the busiest in the world with more than 70 departures in each direction every day. The route is known as the HH Ferry route and has been sailed by several shipping lines through history. The car ferry terminal is connected to the town's main railway station. From the station, trains depart to Copenhagen every 20 minutes. Trains also depart to Hillerød and Gilleleje. There are another 6 stations or train stops within the city and connected suburbs. Apart from Helsingør Station and Ferry Terminal also Snekkersten station, Espergærde station, Mordrup station and the train stops at the line to Gilleleje, Grønnehave, Marienlyst and Højstrup. The E47 Motorway towards Copenhagen begins just outside the city limits. The town and surrounding areas also has a network of local and regional buses. For a century, the Helsingør Værft or Elsinore shipyard was a prominent landmark, which covered the whole area between the town and Kronborg Castle. It was founded in 1882. At its height in 1957, it had 3,600 employees. The last ship left the shipyard in 1983 and it closed the same year following heavy losses. The Wiibroe brewery, founded in 1840, was the second brewery in Denmark to ship bottled beer, just three years after Carlsberg. The last beer was brewed at Wiibroe in Helsingør in 1998. Carlsberg continues to brew beer under the Wiibroe Årgangsøl label. After the end of the industrial era, the town of Helsingør had to redefine itself, and came up with an ambitious project: Kulturhavn Kronborg, literally "Culture-harbour of Kronborg". It officially opened on 26 May 2013, intended to appeal to tourists with an interest in culture. The main attraction of Kulturhavn Kronborg is Kronborg Castle, a UNESCO World Heritage Site. Besides the historical attractions of the site, William Shakespeare's play Hamlet is performed annually in its courtyard since 1937. There is a longstanding tradition of performing the play in English, and notable actors in the title role have included Laurence Olivier, John Gielgud, Christopher Plummer, Derek Jacobi, and in 2009 Jude Law. At the heart of Kulturhavn Kronborg lies kulturværftet or The Culture Yard, a new cultural centre and a public library located in the old dockyard. It opened in 2010. The former dry dock now houses the Danish Maritime Museum. In the centre of the harbour basin stands the polished steel sculpture Han (He) by artist duo Elmgreen and Dragset, commissioned by the City of Helsingør in 2012. It was inaugurated by then Minister of culture, Uffe Elbæk, in June 2012. It is seen as the counterpart (and even little brother) to Edvard Eriksen's world-famous The Little Mermaid statue in Copenhagen, and has caused both praise and protests among locals. The Swedish city of Helsingborg lies a short distance across the Øresund from Helsingør, approximately 4 km (2 mi). European route E55 joins the two cities; ferries connect the two sides. The new Danish Maritime Museum was designed by Danish prize-winning architects Bjarke Ingels Group (BIG). Jørn Utzon lived in Helsingør in his youth because his father was an engineer at Helsingør Værft. Utzon designed The Kingo Houses (1956–60) and The Hammershøj Care Centre (1962) in the city. The project was completed by Birger Schmidt (1966) after Utzon moved to Sydney to work on the Sydney Opera House. Christiern Pedersen (c.1480–1554) Danish canon, humanist scholar, writer, printer and publisher. Johan Isaaksz Pontanus (1571–1639) Dutch historiographer. Robert Cleaver Chapman (1803–1902), known as the "apostle of Love", was a pastor, teacher and evangelist. Morten Løkkegaard (born 1964) Danish politician and Member of the European Parliament. Pieter Isaacsz (1569–1625), Danish-born Dutch Golden Age painter. Bernhard Keil (1624–1687) Danish Baroque painter who became a pupil of Rembrandt. Johan Frederik Møller, (1797–1871) Danish painter and photographer. August Schiøtt (1823–1895) Danish portrait painter. Vilhelm Melbye (1824–1882) Danish marine artist. Peter Elfelt (1866 – 1931) Photographer and Cinema pioneer, first Danish film. Alfred Lind (1879–1959) Danish cinematographer, screenwriter and film director of the silent era. Ove Verner Hansen (1932–2016) Danish opera singer and actor. Morten Rudå (born 1960) Norwegian actor. Helle Fagralid (born 1976) Danish actress of Faroese descent. Susanne Grinder (born 1981) Danish ballet dancer, joined the Royal Danish Ballet in 1998, becoming a principal dancer in 2012. Jørgen Iversen Dyppel (1638–1683), the first governor of the Danish West Indies 1672/1680. Christian Frederik Hansen (1788–1873), Danish military officer who served as Minister of Defence. Ludvig Lorenz (1829–1891), Danish physicist and mathematician, named the Lorenz gauge condition. Gordon Norrie (1855–1941) Danish surgeon and ophthalmologist of Scottish parentage, named Norrie disease. Steen Rasmussen (born 1955), artificial life scientist, coined the term "complex systems dogma". Stephen Hansen (1701–1770) Danish industrialist, businessman and General War Commissioner. Jean Abraham Grill (1736–1792), Swedish merchant, director of the Swedish East India Company. Hartvig Marcus Frisch (1754–1816) was director of the Royal Greenland Trading Department 1781/1816. William Fell (1815–18??) Merchant and member of the Society of California Pioneers. Fell Street in San Francisco named after him, List of San Francisco placename etymologies. Sir Edward Knox (1819–1901) Danish-born Australian politician, sugar refiner and banker. Simon Spies (1921–1984) Danish tycoon. Tue Hellstem (born 1961) Danish modern pentathlete, competed at the 1988 Summer Olympics. Mads Vibe-Hastrup (born 1978) Danish professional golfer. William Shakespeare's play Hamlet (whence the English spelling "Elsinore" derives) takes place mostly at Kronborg Castle in Helsingør. In the 1983 comedy Strange Brew, which is loosely based on Hamlet, the protagonists are given jobs at Elsinore Brewery. In Patrick O'Brian's Aubrey–Maturin series, Helsingør fires mortar shells at the heroes in book seven, The Surgeon's Mate, as they sail past on their way to a rendezvous in the Baltic. In Bret Easton Ellis's novel Lunar Park, the street on which the character Bret Easton Ellis lives, with his own haunting father-son issues, is called Helsingør Lane. Several stories written by the Danish author Karen Blixen (or Isak Dinesen) take place in Helsingør, including "The Supper at Elsinore" in her first published volume of stories, Seven Gothic Tales. A well-known poem by the Portuguese surrealist poet Mário Cesariny is named "You are welcome to Helsingør". Children's author Richard Scarry depicted Helsingør as "A Castle in Denmark" in the book Busy, Busy World. Indie-rock band The Essex Green recorded a song titled "Elsinore" for their 2006 album Cannibal Sea. In David Brin's novel The Postman, the first chapter features an apparition that appears to protagonist Gordon Krantz. It is described as an "Elsinorian figure" and greets Gordon with "Alas, poor Gordon! ", both allusions to Hamlet. Surrealist artist René Magritte has a painting named after the city, depicting a castle, which might be modeled after Elsinore Castle. ^ "Helsingør". The American Heritage Dictionary of the English Language (5th ed.). Boston: Houghton Mifflin Harcourt. 2014. Retrieved 8 February 2019. ^ "Helsingør". Collins English Dictionary. HarperCollins. Retrieved 8 February 2019. ^ "Helsingør". Oxford Dictionaries. Oxford University Press. Retrieved 8 February 2019. ^ "Helsingør". Merriam-Webster Dictionary. Retrieved 8 February 2019. ^ "Population 1. January by urban areas (DISCONTINUED) - StatBank Denmark - data and statistics". Statistikbanken.dk. Retrieved 15 December 2017. ^ "Danske byers historie gennem 1300 år" (PDF). Byhistorie.dk. Retrieved 15 December 2017. ^ "Helsingør Turistbureau - Victoria Design". Visithelsingor.dk. Retrieved 21 October 2009. ^ "Helsingborg ferry, compare prices, times and book tickets". Directferries.co.uk. Retrieved 15 December 2017. ^ a b "Forside - DOT" (PDF). Moviatrafik.dk. Retrieved 15 December 2017. ^ "Forside - DOT". Moviatrafik.dk. Retrieved 15 December 2017. ^ "Carlsberg Group - Wiibroe Årgangsøl". Carlsberggroup.com. Retrieved 15 December 2017. ^ Sandvad, Karin. "Olivia Nielsen (1852 - 1910)" (in Danish). Kvinfo. Retrieved 31 August 2016. ^ "Gdańsk Official Website: 'Miasta partnerskie'". Gdansk.pl (in Polish and English). 2009. Archived from the original on 23 July 2013. Retrieved 11 July 2009. Wikimedia Commons has media related to Helsingør. Wikivoyage has a travel guide for Helsingør.